January | 2013 | For The Love Of Reading..
My First Read Of 2013..
Meet Keye Street, the new kid on the crime block. A Chinese-American private investigator with two university degrees, she used to work as a criminal profiler for the FBI before she got fired for her alcoholism. Now she’s in recovery, trying to get her private investigation firm off the ground and working as a part-time bounty hunter to make ends meet. And, just to compound matters, she’s in love with her best friend – a lieutenant in the Atlanta Police Department. If it sounds like there’s quite a lot going on in Keye’s life then that would be putting it mildly [I might have managed to fit in a very small percentage of her voluminous backstory!]. Weirdly, this was actually one of my only – and biggest – gripes with the novel. There’s almost too much going on in Keye’s life! But, as a character-driven piece of crime fiction, it really is an amazingly assured debut. Reading the cover copy and press release I was struck by the setting [Atlanta, Georgia] and the theme [serial killer thriller], and immediately assumed that it was going to be in the vein of Karin Slaughter [not a bad thing. There’s even a quotation from Slaughter on the jacket]. But I wasn’t quite right. 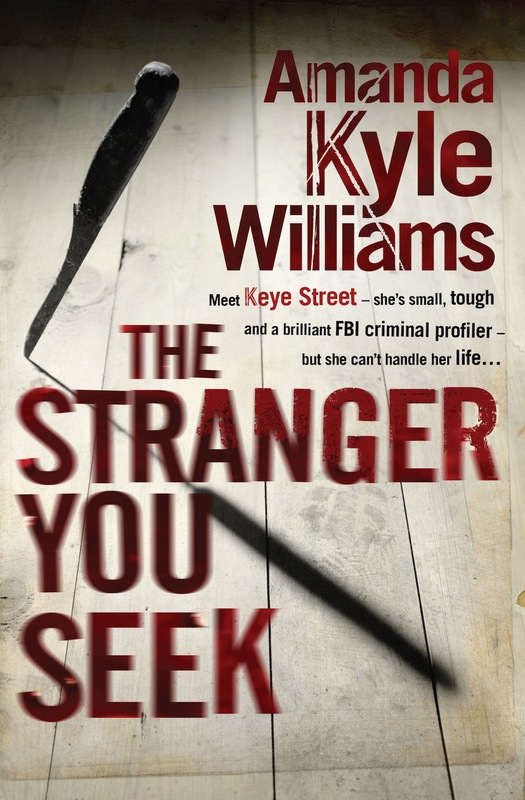 For, despite the similarities to Slaughter’s oeuvre, I actually found that reading The Stranger You Seek reminded me of Brett Easton Ellis and Jeff Lindsey’s Dexter series [indeed, there’s even a blood-spatter analyst working for the Atlanta PD in Kyle Williams’s novel!]. There’s something incredibly forceful and individual about Keye’s first-person narrative – something that, for me, was very reminiscent of Dexter’s unique voice. At certain points, the pure amount of things going on in Keye’s life was a bit overwhelming, but there is also something fresh and different about the book and Kyle Williams’s prose that made me fly through the book at a furious rate [which was very possibly aided by the number of deaths in the book – I’m a sucker for a good serial killer novel!]. And the novel evokes the swelteringly oppressive heat of summertime Atlanta brilliantly, and there is a real feeling of suspense and danger throughout the book. I do have to admit that I did work out the book’s major twist quite quickly, but I would like to believe that this was due to my incredibly good deductive skills [and having read far too much crime fiction!]. But, even then, it didn’t spoil my enjoyment of the novella and in the end I didn’t get the killer quite right [I missed by a fraction, but it was still a miss!]. What will be interesting going forward is to see how Kyle Williams’s next book will shape up. At the moment, Keye Street blazes off the page. But she is surrounded by a constellation of equally intriguing characters, and I am looking forward to seeing how they are developed and fleshed out in future books in the series.